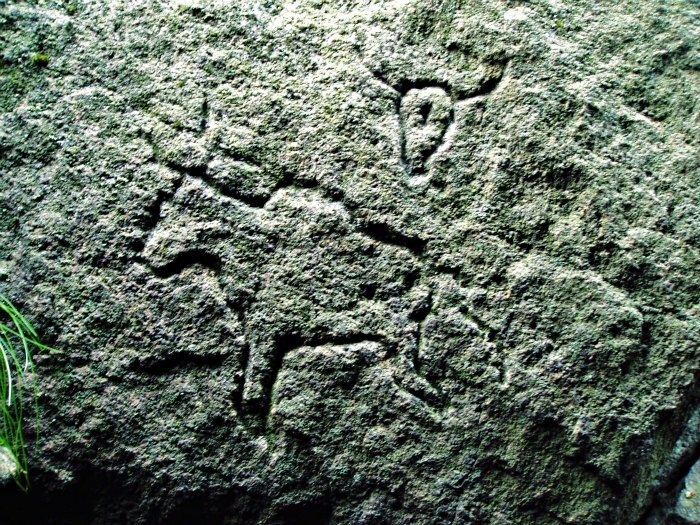 Are these prehistoric carvings of a bison and elk "prehistoric" or are they more recent, Victorian carvings. These two rock-art carvings can be found upon Boulsworth Hill above Thursden Valley, near Trawden, Lancashire. A friend has given me permission to put this photo on here. The grid reference for the site is being kept secret to avoid any idiot going and destroying the carvings, but I, myself, know what the co-ordinates are. Does anyone have any ideas as to whether the carvings are of a prehistoric date, or more recent ? Hi Ray - Looks nice, but seems more a North American design than owt British. I'd say it was pretty recent by the look of things. I went up today and finally found them after numerous attempts in the past. It's like a weights been lifted ha. I suppose it'd be difficult for anyone to put a date to them but I'd like to hear the view of someone more knowledgable than me in this sort of thing because they are intriguing. Good man, David. Glad you finally found what you were looking for and enjoyed your ramble onto the moors. They might be a Victorian fake, but still well worth looking at. The Victorians were in to this sort of thing - from fake Celtic stone heads to rock carvings and even fake burial chambers and standing stones etc.